Jika rekan – rekan sebelumnya tidak pernah belajar 3D, teknikal drawing atau analisis geometry, disini rekan – rekan akan mulai mempelajarinya, kemampuan yang secara fundamental digunakan untuk Blender dan 3D modeling lainnya. 3D modeling itu berdasar pada geometry cabang dari matematika, analisis geometry, yang mana di ekspresikan dengan menggunakan rumus Aljabar. Rekan – rekan mungkin sudah mempelajarinya disekolah sehingga beberapa terminology berikut akan terasa familiar. Susah kalau diterjemahin ke bahasa Indonesia. Look around the room you’re in. The odds are it will have a cuboidal shape, with four vertical walls at right angles to each other, a flat, horizontal floor, and a flat, horizontal ceiling. Now imagine there’s a fly buzzing around the room. (If there really is a fly buzzing around, feel free to look at it instead of imagining.) The fly is moving in three-dimensional space. In mathematical terms, what that means is that, at any moment, its position within the room can be expressed in terms of a unique combination of three numbers. Consider the south-west corner of your room, the point at floor level. We will call this (arbitrary) point the origin of our coordinate system, and the three numbers at this point will be (0,0,0). The first of the three numbers will be the distance (in some suitable units, let’s say metres) eastwards from the west wall, the second number will be the distance northwards from the south wall, and the third number will be the height above the floor. Each of these directions is called an axis (plural: axes), and they are conventionally labelled X, Y and Z, in that order. With a little bit of thought, you should be able to convince yourself that every point within the space of your room corresponds to exactly one set of ( X, Y, Z ) values. And conversely that every possible combination of ( X, Y, Z )values, with 0 ≤ X ≤ W, 0 ≤ Y ≤ L and 0 ≤ Z ≤ H (where W is the east-west dimension of your room, L is its north-south dimension, and H is the height between ceiling and floor) corresponds to a point in the room. The following diagram illustrates how the coordinates are built up, using the same colour codes that Blender uses to label its axes: red for X, green for Y and blue for Z (an easy way to remember this if you're familiar with RGB is the order -- Red X, Green Y, Blue Z). In the second picture, the value for x defines a plane parallel to the west wall of the room; in the third picture, the value for y defines a plane parallel to the south wall; and in the fourth picture, the value for z defines a plane parallel to the floor. Put the planes together in the fifth picture, and they intersect at a unique point. This style of coordinate system, with the numbers corresponding to distances along perpendicular axes, is called Cartesian coordinates, named after René Descartes, the 17th-century mathematician who first introduced the concept. Legend has it that he came up with the idea after watching a fly buzzing around his bedroom! There are other ways to define coordinate systems, for example by substituting direction angles in place of one or two of the distance measurements. These can be useful in certain situations, but usually all coordinate systems in Blender are Cartesian. However, switching between these coordinate systems is simple and easy to do in Blender. Can coordinate values be negative? Depending on the situation, yes. Here we are only considering points within our room. But supposing, instead of placing our origin in the bottom southwest corner, we put it in the middle of the room, halfway between the floor and ceiling. (After all, it is an arbitrary point, we can place it wherever we would like to, just as long as we all agree on where it is.) Now, remember that our X-coordinate is the distance east from the origin; How do we express the fact that a point lies west of the origin? Simple: We give it a negative X-coordinate. Similarly, points north of the origin have a positive Y-coordinate, while those south of it get a negative Y-coordinate; and those points above the origin get a positive Z-coordinate, while those below it get a negative Z-coordinate. Now you can orient your hand so that the thumb points along the X-axis in the positive direction (direction of increasing coordinate numbers), the index finger along the positive Y-axis, and the middle finger along the positive Z-axis. Another way of looking at it is, if you placed your eye at the origin, and you could see the three arrows pointing in the directions of positive X, positive Y and positive Z as in Figure 1, the order X, Y, Z would go clockwise. Consider a spinning ball. Every point on it is moving, except the ones right in the middle: these form a line of stillness around which the rest of the ball spins. This line is called the axis of rotation. More precisely, the axis of rotation of a rotating object over a period of time is a point or a line connecting points that do not change position while that object rotates, drawn when the observer assumes he/she does not change position relative to that object over time. Yet another way to understand this is to make a fist with your right hand, with the fingers bent towards you. Stick out your thumb directly to the right(X). Now aim pointer finger straight up(Y). Finally make your middle finger pointing towards yourself(Z). This is looking down from above directly on top of origin. If the rotation follows the direction of the curled-up fingers, then the direction of the axis of rotation is considered to be the same as the direction which the thumb is pointing in. This gesture is a different form of the right-hand rule and is sometimes called the right-hand grip rule, the corkscrew-rule or the right-hand thumb rule. From now on in this book, it will be referred to as 'the right-hand grip rule'. When describing the direction of a rotating object, do not say that it rotates left-to-right/clockwise, or right-to-left/counterclockwise. Each of these claims on their own are useless, because they're relative to the observer. Instead of saying this, find the direction of the axis of rotation and draw an arrow to represent it. 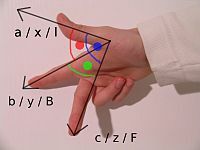 Then people who know the right-hand grip rule will be able to figure out what the direction of rotation of the object is, by using the rule when interpreting your drawing. 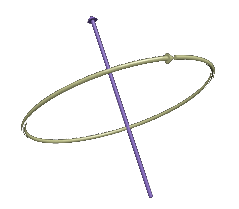 Cartesian coordinate system at Wikipedia.